With commercial trucks weighing up to 30 times as much as the average passenger vehicle, any kind of truck crash has the potential to result in serious injuries or even deaths. However, few types of truck accidents are as deadly as underride crashes, which occur when a passenger vehicle slides under the truck and becomes wedged under its trailer. In an underride accident, the top of the passenger vehicle is often sheered away, resulting in horrific injuries and deaths. In fact, according to the National Traffic Safety Administration (NHTSA), approximately 25 percent of all truck accident fatalities involve an underride incident. If you sustained significant injuries—or lost a loved one—in an underride truck accident, you may be entitled to compensation. Here's what you need to know before taking legal action. Rear-end crashes. These crashes result in more underrides than any other type of accident. NHTSA data shows that underrides occur in roughly 75 percent of truck crashes involving passenger vehicles. Side-impact accidents. 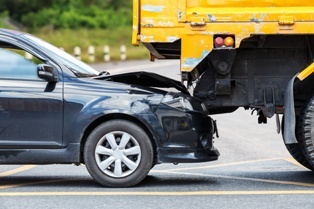 Underrides occur in nearly 54 percent (53.9 percent) of crashes involving collisions between passenger vehicles and the sides of large trucks. Frontal collisions. 72 percent of accidents involving the front of a large truck lead to underride incidents, according to the NHTSA. Offset crashes. Accidents in which a passenger vehicle strikes the outer-left or outer-right third of the truck in front of them are known as offset crashes. Often the result of attempting to maneuver to avoid a collision, offset accidents can also lead to underrides. Truck driver error. Examples include making an improper turn, failing to signal before turning, slamming on brakes, interrupting the flow of traffic, or failing to check blind spots before changing lanes. Speeding, distracted driving, drowsy driving, or drunk or drugged driving are other driver errors that could lead to accidents and underrides. Inadequate truck maintenance. Commercial trucks require frequent inspections and maintenance in order to ensure they're safe for the road. Inadequately maintained brakes are an example of a component that could fail, leading to crashes and underride incidents. Insufficient guards. Rear guards are a requirement for most commercial trucks in the United States. However, if these guards are missing, outdated, or broken, they hardly serve the intended purpose. Additionally, though they may not be required by law, side and front guards can help prevent dangerous side and front underride accidents. In underride accident cases, the at-fault party may be the commercial truck driver, the company they drive for, the party responsible for performing vehicle maintenance, or even the manufacturer of a faulty truck component. An experienced Delaware attorney can help truck accident victims determine the appropriate party to name as defendant in a personal injury lawsuit. Do you have questions about how to take legal action after being injured—or losing a loved one—in an underride truck accident? Contact the Morris James Personal Injury Group today to schedule an appointment for a free, no-obligation initial case consultation. Is a Trucker or Company Responsible for My Injuries?